SPANISH RAILWAY - railmeds JimdoPage! The Córdoba–Málaga high-speed rail line is a standard gauge railway line of 155 km in length (the total distance between Córdoba and Málaga on the line is 170 km), inaugurated on 24 December 2007. Designed for speeds of 300 km/h (186 mph) and compatibility with neighbouring countries' rail systems, it connects the cities of Malaga and Cordoba in Andalusia, Spain. This is part of the rail-route Madrid - Malaga and is connected to Madrid – Sevilla high speed rail line The line also has stops at Puente Genil and Antequera that are served by the AVANT service. At the time the service opened, RENFE was running 22 trains daily between Madrid and Málaga. The line runs through precipitous terrain in the Sierra Nevada and several viaducts and tunnels were necessary to complete the connections, including the Guadalhorce viaduct (574m), the Tunnels de Abdalajis (the 3rd longest in Spain after the Guadarrama and Pajares tunnels at 8970m in the Cordillera Bética), the Arroyo de las Piedras viaduct (1208m long and 93.4m high, making it the highest viaduct along the line), the Arroyo del Espinazo and Jevar viaducts (the longest viaduct along the line when the two are considered together) and the Alora, espartal, Tevila, Gibralmora and Cartama tunnels that exist in a long chain. The precipitous terrain is one possible reason why the Córdoba-Seville section was opened in 1992, but the Córdoba-Málaga section wasn't opened until December 1997. The AVANT services transport passengers directly from Seville to Málaga and vice-versa, with intermediate stops at Puente Genil-Herrera and Antequera-Santa Ana stations between Córdoba and Málaga. The AVE service (using the AVE Class 102) offers Madrid-Málaga journey times of 2 hours and 30 minutes with direct services. The average speed of 205 km/h for this journey is not particularly high (the fastest Madrid-Barcelona journey is 2 hours and 38 minutes over 621 km, giving an average speed of 236 km/h): - trains are restricted to 200 km/h in the Sierra Morena (here, the curvature drops as low as 2300m, meaning the maximum safe speed without tilting technology is approximately 226 km/h, as a curvature of at least 1800m is needed for 200 km/h and 7200m for 400 km/h ). The trains also slow down to 160km/h for the Abdalajis and Gobantes tunnels, even though the tunnel radii are high enough to support 300km/h. 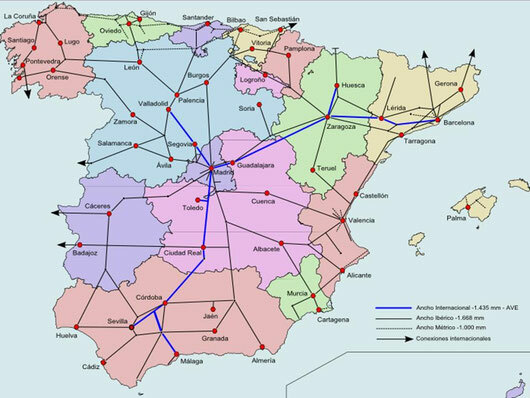 The Madrid–Barcelona high-speed rail line is a 621-kilometre (386 mi) standard gauge railway line inaugurated on 20 February 2008. Designed for speeds of 300 km/h (186 mph) and compatibility with neighbouring countries' rail systems, it connects the cities of Madrid and Barcelona, in Spain. Work is underway to extend the line into France to connect with the European high speed network in 2012. The Madrid-Sevilla high speed line (NAFA or Nuevo Acceso Ferroviario a Andalucía) is a 472 kilometers (293 mi) Spanish railway line for high speed traffic between Madrid and Seville. The first Spanish high speed rail connection has been in use since 21 April 1992 at speeds up to 300 km/h (186 mph). Travel time between the two end points was reduced by over half. At Cordoba the Madrid – Malaga high speed line leaves the line from Madrid. The Madrid–Valladolid high-speed rail line opened for commercial service on 23 December 2007 and is the first instalment of a high speed rail corridor in the north and northwest of Spain. The line is built to standard gauge and gauge changers are provided at strategic points to allow interchange with older Spanish railways which were built to Iberian gauge.